Clinical Reasoning in Small Animal Practice presents a revolutionary approach to solving clinical problems. As a veterinarian, especially as a student or new graduate, a ten minute consultation in a busy small animal practice can be a daunting task. By guiding you to think pathophysiologically, this book will help solve clinical problems as efficiently as possible. 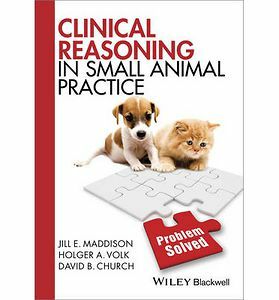 The authors set out a structured approach with easy to remember rules which can be applied to most clinical signs small animals present with. This reduces the need to remember long lists of differentials and avoids the potential of getting trapped by a perceived obvious diagnosis. The book will help to unlock your potential to solve clinical problems. It also provides a logical rationale for choosing diagnostic tests or treatments which can be clearly communicated to the owner.